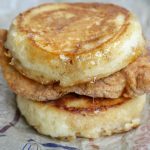 Crispy fried chicken fillet, sandwiched between two soft and pillowy McGriddles with pockets of oozing sweet maple syrup! In a small saucepan with a candy thermometer attached, add 1 cup of pancake syrup over medium heat. Allow it to come to a boil, stirring occasionally until it calms down. Watch the temp closely and swirl occasionally until it reaches 265 degrees (about 10 minutes total). Remove from the heat and carefully pour into prepared baking dish, spreading it around evenly. Set pan aside to cool as you prepare the chicken and McGriddles. You can put it in the freezer to speed up the cooling. Once the syrup is set, break it into small shards that are about dime and nickel size. Put a handful of the pieces into a bowl near the stove for later use. Heat oil in a fry-safe pot over medium-high heat (about 375 degrees). Prepare a surface to place the finished fried chicken – a cooling rack beside the stove, lined with layers of paper towels or brown bags. In a small bowl, combine the beaten egg and water. Mix well. Place the prepared chicken fillets into the flour mixture to coat thoroughly, dip into the egg wash, and then back into the flour mixture. Ensure all of the surface area of the chicken fillets are covered in batter. Fry the chicken in batches as to not overcrowd the pan, adjusting the temp as needed to maintain temperature. When chicken is near cooked (about 6-7 minutes), remove from the pot and place onto prepared surface. Allow it to cool for just a minute or so and place back into the pan for an additional 1-2 minutes. Remove from the frying oil and allow to cool. Optional: place chicken into the oven to stay warm while preparing the McGriddles. In a bowl, combine the pancake mix, milk and vanilla extract. Mix until just combined. Place the 3-inch round cookie cutter at the bottom of the pan and pour a few spoonfuls of batter into the circle. Spread around for full coverage. Place a few shards of the syrup glass onto the batter (as many or few chunks as you’d like). Top with a few more spoonfuls of batter. Two 3-inch metal round biscuit/cookie cutter are needed to achieve perfect circular McGriddles. You can use just one but it will take a little longer.